The Sinomlando Centre devotes a important part of its efforts to the training and mentoring of community members in oral history and memory work. It runs a wide range of training programmes in English and in isiZulu. Particular attention is paid to monitoring and evaluation. The aim of these programmes is to empower communities with the skills required to record and document their own histories. Sinomlando's directors Philippe Denis (left) and Radikobo Ntsimane congratulate Nqobile Khumalo. 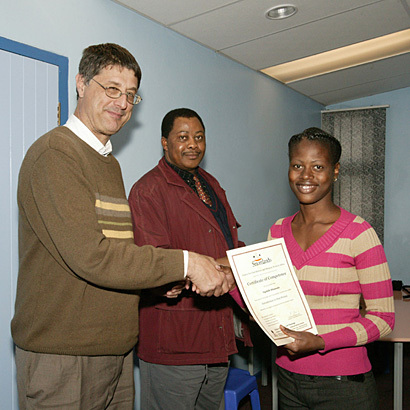 The young woman is one of 23 prospective tour guides who received Oral History certificates in June 2008 in the Mpophomeni Public Library. A typical oral history workshop lasts three days. It includes formal lectures, group discussions and exercises. The participants are invited to report on the fieldwork done subsequently at a follow-up workshop which takes place a few weeks later. A certificate of competence is awarded on completion of the programme. To develop capacity in oral history, the Sinomlando Centre has published a training manualand designed a release agreement form.